The Scarlet Painted Cup belongs to a large and interesting group of plants, known as the figwort family. This family includes about one hundred and sixty-five genera and over twenty-five hundred species. They are common all over the world, reaching from the equator into the regions of constant frosts. It is claimed by some authorities that fully one thirty-fifth of all the flowering plants of North America are classed in this family. Besides, the painted cup, there are classed in this group the mullein, the common toad-flax, the foxglove, the gerardias, and the calceolarias. The scarlet painted cup of our illustration is a native of the eastern half of the United States and the southern portion of Canada. It prefers the soil of meadows and moist woods, and has been found growing abundantly at an elevation of from three to four thousand feet. The flowers are dull yellow in color and are obscured by the rather large floral leaves or bracts, which are bright scarlet-rarely bright yellow-in color. These conspicuous leaves are broader toward the apex and usually about three-cleft. By the novice they are usually mistaken for the flower, which is hardly noticeable. The stem seldom exceeds a foot in height, and bears a number of leaves that are deeply cut in narrow segments. The bright color of this plant has given it many local common names, more or less descriptive. 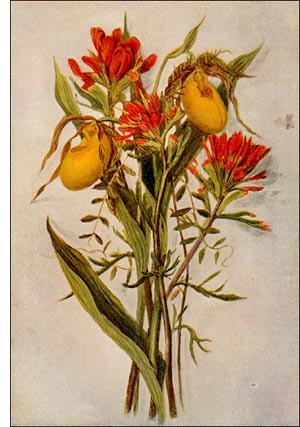 Prominent among these is the Indian paint brush.